BELIZE CITY, Mon. Mar. 20, 2017–In NEBL Thursday night action, the (4-3) Belmopan Bandits shocked league leading San Pedro Tiger Sharks by the final score of 71-69, thereby propelling themselves into a first-place two-way tie with arch-rivals Cayo Western Ballaz, who also won their game on Friday night. The Tiger Sharks had a seven-point lead with 9:46 remaining in the game, but the Bandits surged ahead, 60-58, at the 6:44 mark in the fourth quarter, behind back-to-back field goals by Greg Rudon (8 points 2 rebounds 1 assist). That set off an 11-0 Tiger Sharks run, which was sparked by a flurry of seven made free-throws, shared between Douglas Valley and George Williams, and capped by a deep trey by the latter, which gave them a 69-61 lead with just 3:32 remaining in regulation. However, the hometown Bandits rebounded and closed the game on a 10-0 run, to come away with the win. Farron Louriano accounted for five of his team’s last ten points scored in the waning moments of the fourth quarter, which, obviously, was key in the 71-69 win. 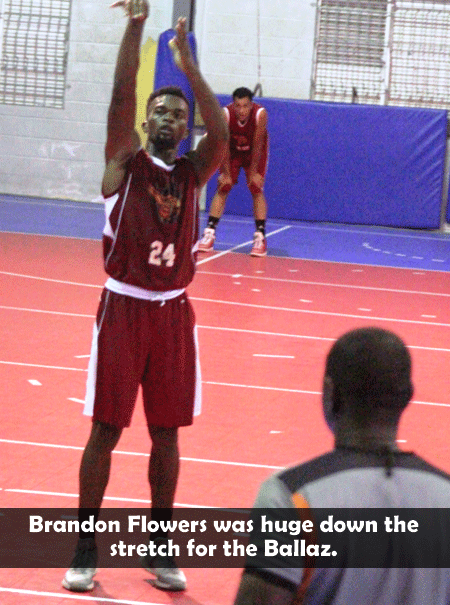 Richard Smith III led the Bandits with 18 points, to go along with 6 rebounds in 37 minutes of play. Edgar Mitchell added 12 pts 7 rebs 6 assts, while teammate Farron Louriano recorded a double-double, hitting for 11 pts 13 rebs. League leading scorer, George Williams scored a game high 24 pts to lead the Tiger Sharks, followed by Raul Roches 22 pts 6 rebs 2 assts and Douglas Valley 15 pts 4 rebs. The game was evenly played, with none of the teams displaying any distinct advantage; both shot in the low 30’s from the field, while team rebounds was close, with the Bandits enjoying the slim 46-44 edge. The Western Ballaz improved to (5-3) following their 82-78 victory over defending champs Smart Hurricanes on Friday night at the Sacred Heart College Auditorium. 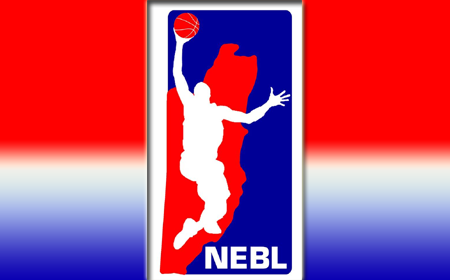 This win obviously gave their resume a boost, catapulting them straight to the top of the NEBL standings. Similar to last week’s come-from-behind win in Orange Walk Town, the Ballaz once again engineered a second-half avalanche to overcome a 10-point deficit and shock the Hurricanes, feeding off the energy from the home crowd to put an awful first-half performance in the rearview mirror. Richard Troyer and Darwin Leslie led the charge for the Ballaz with 21 pts 9 rebs 2 assts, and 17 pts 3 rebs 3 assts, respectively. They also got plenty of help from the Flowers brothers (Ivan and Brandon), who accounted for 15 of their team’s last 32 points, as the Ballaz were able to dominate the fourth quarter. Meanwhile, the Hurricanes had four players scoring in double figures, led by Akeem Watters with a double-double 15 pts 12 rebs. He was followed by Andrew Ortiz with 12 pts 7 rebs 4 assts, Glency Lopez with 11 pts 4 rebs 5 assts, and Brian White with 11 pts 12 rebs. As a team, they shot 40% from the field on 29 of 71 shots. They were atrocious at the charity stripe, hitting just 17 of 39 attempts for a 43% clip, and were outrebounded, 50-45. The Ballaz shot 47% from the field on 32 of 67 shooting, and was better at the charity stripe, hitting 15 of 31 attempts. They had 19 turnovers, but the Hurricanes could only convert those turnovers into 15 points. They had solid bench support (22 points), and outscored their opponents 48-44 in the paint. Entering the game with just two wins in their first six games, and holding on for dear life in a very competitive 2017 NEBL championship, the Orange Walk Running Rebels pounced early on the visiting Dangriga Dream Ballers, and jumped out to an early 26-14 first quarter lead behind Roger Reneau’s 11 first quarter points and Leon Jacobs’ 8 points. The Dream Ballers responded quickly at the start of second quarter, with back-to-back field goals coming by way of jump shots from Akeem Watters and a monster dunk from Griga’s big-man in the middle, Tahj Wells. The Ballers would outscore the Rebels, 22-14, in the second quarter, to pull within one point of the lead, 37-36, at the end of first-half play. It was practically nip and tuck the rest of the way, with four ties and the lead being changed five times. The Rebels miraculously managed to take a 59-56 lead in the fourth quarter at the 9:38 mark, and never relinquished that lead for the remainder of the game, as they recorded their third win of the season. 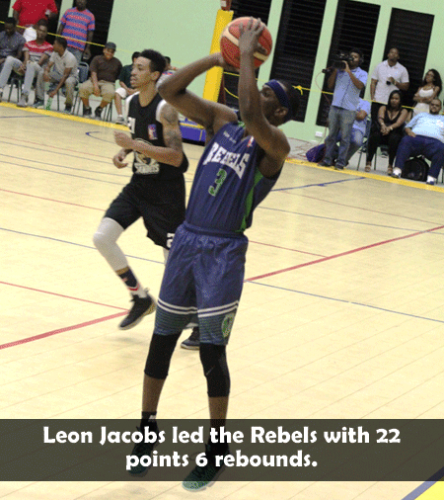 Leon Jacobs of the Rebels finished with 22 pts 6 rebs, knocking down 6 of 13 from the field, and his three 3-pointers proved big in the win. Roger Reneau added 20 pts 3 rebs 2 assts, while James Ewing recorded a double-double with 14 pts 17 rebs. Dangriga’s Dillmore Conorquie was the game high scorer, totaling 23 pts 6 rebs 2 assts, while teammate Tahj Wells contributed 16 pts 12 rebs. Unfortunately, Quinton Bowen, the other part of the “big three,” was not effective, and had a sub-par performance, totaling just 7 pts 6 rebs in the loss. The Ballers, best known for their stingy defense and rebounding, was, for the first time this year, limited to under 50 team rebounds; and for all intents and purposes, the Rebels kept that department manageable, giving up just 43 rebounds to the Ballers, while scoring 75 points against them. The key to the game, however, was the 27 turnovers committed by the Ballers, which the Rebels converted to 27 points.